Gluten-free honey cake provides a sweet start to the new year. For Rosh Hashanah, the Jewish new year, we greet each other with “Shana Tovah Umetukah” – wishes for a happy and sweet new year. To symbolize sweetness, many families serve honey cake, a traditional Rosh Hashanah dessert. Which, as usual, leaves me searching for a great-tasting gluten-free alternative. For inspiration, I started with Marcy Goldman’s vaunted “Majestic and Moist New Year’s Honey Cake” from “A Treasury of Jewish Holiday Baking.” I used gluten-free flour, subbed some applesauce and increased the orange juice to keep the cake moist and sweet. Buckwheat flour — a dark, strong gluten-free flour that’s high in protein, fiber and magnesium — works well here, complementing the complex flavors in the cake. Interestingly, buckwheat is not related to wheat but is a member of the rhubarb family. 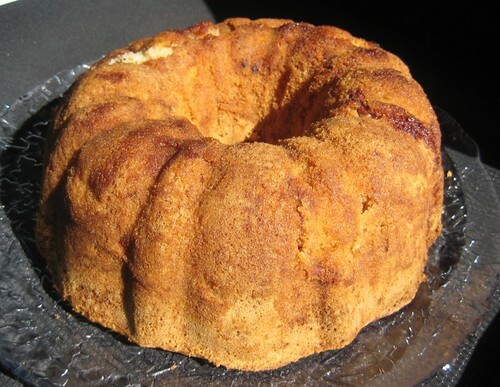 A traditional Rosh Hashanah dessert: Jewish apple cake. I love this photo, taken in my living room! Shanah Tovah! Best wishes for a happy Rosh Hashanah and a sweet new year. We’re getting this new year off to a tasty start, with a gluten-free version of traditional Jewish apple cake. My mother is famous for her Jewish apple cake, laced with apples that she plucks from the trees in her back yard. I’ve always wondered, though, what makes the apple cake “Jewish.” Really, I didn’t know that cakes could have a religion. The answer seems to be that the cake is made with vegetable oil and orange juice, instead of butter and milk, thus making it pareve (neither dairy nor meat). Apple cake is also a favorite dessert for Rosh Hashanah, when we eat apples dipped in honey to symbolize hopes for a sweet new year. Mom’s recipe worked surprisingly well in its gluten-free version. I substituted gluten-free flours, added xanthan gum (a binder for GF baking) and left the rest of the recipe intact. 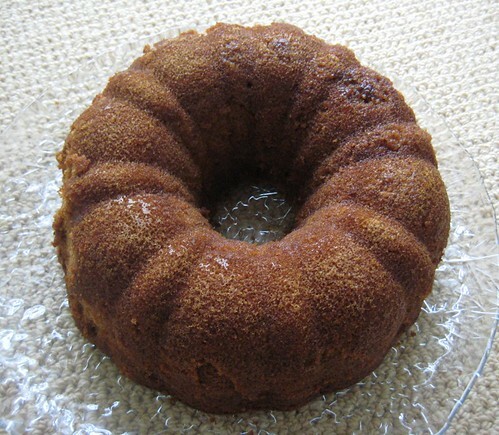 The cake is moist and bursts with the flavors of apples and cinnamon. 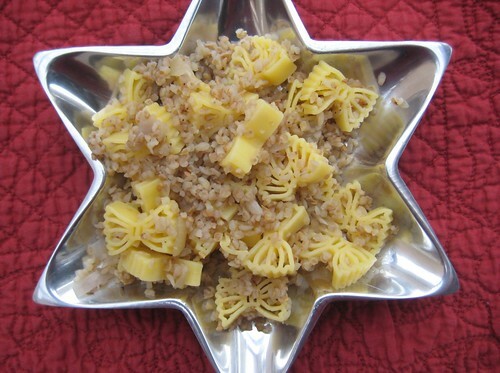 Kasha varnishkes is a traditional Russian-Jewish dish of roasted buckwheat groats (kasha) tossed with bowtie noodles. 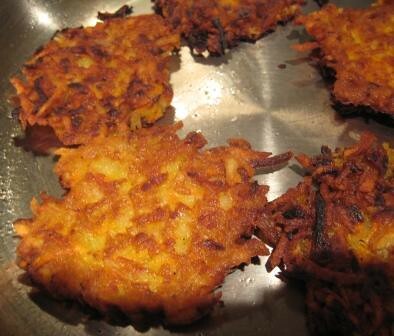 Apparently, my grandfather hated kasha, as he had too many memories of eating it growing up. But we love it. To me, this earthy, satisfying dish typifies Old Country cooking. Despite its name, buckwheat is not related to wheat. Rather, it’s a nutritious, gluten-free whole grain from the rhubarb and sorrel family. Until now, I had to make kasha varnishkes with gluten-free fusilli pasta, as there was no gluten-free bowtie or farfalle pasta available. I was thrilled when Le Veneziane, a superb corn pasta from Italy, recently released gluten-free farfalle. I wish we had gluten-free farfalle pasta a few years ago, since some of my daughter’s preschool and kindergarten projects used bowtie pasta. Don’t get me started, though, on schools’ unnecessary use of food in the classroom. Kasha varnishkes can be served as a side-dish for brisket or it can stand alone as a vegetarian entree.